Photo: Widehall, ca. 1769, 101 Water Street, Chestertown, MD. Listed on the National Register of Historic Places in 1972. Photographed by User:Acroterion (own work), 2009, [cc-by-3.0 (creativecommons.org/licenses/by/3.0)], via Wikimedia Commons, accessed September, 2016. 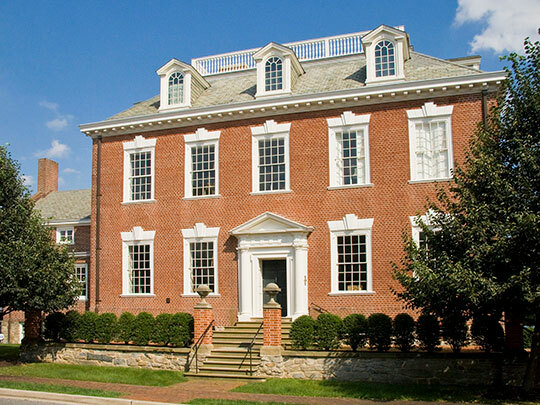 Kent County Courthouse is located at 400 High Street, Chestertown MD 21620; phone: 410-778-7435. Kent County, founded in 1642, is the second oldest county in Maryland. Prior to European colonization, the area was inhabited by a mosaic of different native societies, including the Tockwoghs and Wicomisses. Early settlers were greeted with the magnificent expanse of the Chesapeake Bay, the beautiful Chester and Sassafras Rivers, waters teeming with fish; myriads of waterfowl, mighty forests, and rich soil. Although much has changed since then, much remains the same. The hallmarks of Kent County continue to be the Chesapeake Bay, its tributaries, and our rich farmland. Kent County Maryland, Comprehensive Plan, 2006, www.planning.maryland.gov, accessed September, 2012.